If you find yourself searching for “Sell My Fort Collins House,” you’re in the right place! NOCO Invest specializes in helping people just like you sell their homes fast for CASH, and we can help you, too. We offer GUARANTEED all-cash offers, at fair market values for your home. You won’t face any hassle or obligations from us. We’re NOCO Invest, a local real estate investment company owned by local realtors that buys, remodels, and sells homes. We buy homes in Fort Collins and the greater Northern Colorado area, and we’re here to help you with this “Sell My Fort Collins House Fast” guide. We want to make sure you have all the information about selling your house for cash up front to help you make the best decision for your home and family. Well, the main obvious advantage is the fact that we’ll help you sell your home fast. We buy the home in all cash, as it is. There’s not a lengthy process to get it ready to list, and you don’t have to go through the trouble of open houses, showings, and so on. We can close in as little as just seven days if you need. As we mentioned, we buy your home as is. We won’t hit you with any contingency clauses or things that must be repaired before we close. You don’t have to worry about the condition, paint, or roof when you work with NOCO Invest. Selling your home to us is a fast and pain-free process! By selling your home for cash to NOCO Invest, we’ll pay you top dollar for your home, and you’ll have the money right away. No waiting for banks, no waiting for pre-approvals, none of that. We have cash in the bank, and we’re ready to buy your home today. We’ll cover the closing costs, and you don’t have to worry about the financing of the deal falling through. We’re able to buy your house for cash, saving you time and the stress of listing your home. The first step of selling your Fort Collins home for cash is we’ll come check it out and make you an offer. The beauty of the process is that there is absolutely no obligation for you to sell it to us, and we promise we won’t hassle you or haggle with you on price. If you like our offer, we’ll move forward. If not, no worries whatsoever. Contact us today if you want to learn more about how our process works. Most importantly, we want you to know if you decide to sell your Fort Collins home to us, we’ll offer you fair market value for your home. We won’t low-ball you or try to scam you into anything. We’ll give you what your home is worth and take it as is. 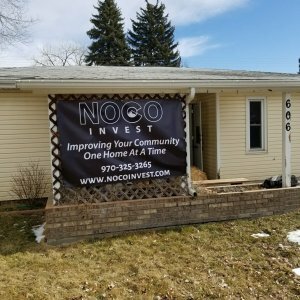 First and foremost, NOCO Invest is a team of local real estate investors, and we’re committed to bettering our community one house at a time. We’re not going to scam you into anything or hassle you about selling your home. When you sell to us, you won’t pay any fees or commissions, we’ll help you close in as little as just seven days, and we’ll buy your home – no matter what shape it’s in. We work with a reputable third-party title company so you don’t have to worry about anything going awry. If you’re ready to sell your Fort Collins home for cash, fast, contact us today! We’ll come look at your home and make you a fair market offer. We buy Fort Collins houses, small apartments, vacant homes, rental properties, bare land, and the right commercial properties. You can take our leave our offer, no strings attached. Once you accept, we’ll close in just a few short days with cash, and you can be on your way. Contact us to get started! Ready to sell your house fast with no obligations? Simply contact NOCO Invest through this easy form on our website, and we’ll be in touch. We’ll make you a fair offer that you can take or leave, no obligations whatsoever. Contact us with any questions or to set up a time to get the ball rolling. Have a property or house that you need to sell? NOCO Invest is currently buying houses in Fort Collins and in surrounding areas in Colorado. If you’re searching for “Sell My Fort Collins House Fast,” we’re here to help! Contact us today, and we’ll be in touch shortly to set up a time to come look at your place!